Generally, to run our Selenium tests in parallel, we use selenium grid and distribute tests across multiple physical or virtual machines which will reduce the time required for running tests. To run tests in parallel, we need to configure Selenium Grid with Hub and Nodes where hub is the central point which will receive test requests along with configurations or capabilities. Based on the request received, hub will distribute tests to the registered nodes. Most of the organisations execute their Selenium scripts on virtual machines. Based on number of scripts, they need to increase the node machines. When the nodes increases maintaining the Grid environment will become a problem in setting up required browsers / OS combinations across these virtual machines. And also, there are times were issues like Browser Crashes, nodes running out of memory, Java processes run out of memory etc kills our time in restating node machines/hub. 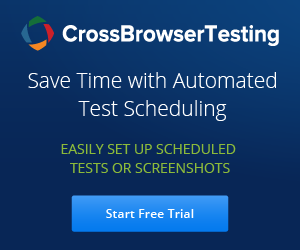 There are few companies who uses Cloud-based platform for automated testing of web/mobile applications like SauceLabs / Browserstack / CrossBrowserTesting but yes these are expensive. Docker is a lightweight container which can make you to run distributed applications in a minute. Docker Containers take up less space than VMs (container images are typically tens of MBs in size), and start almost instantly. Where as each Virtual Machine includes a full copy of an operating system, one or more applications with necessary binaries and libraries which consumes more space and makes slow to boot. Docker is an open platform for developers and system administrators to build, ship, and run distributed applications, whether on laptops, data center VMs, or the cloud. In other words, Docker is a simple container that let's you to specify a complete package of components needed to run a software. We will not discuss much on Docker as there are many articles available on Docker and its architecture. We assume that you have already installed docker and is up running, if not please install Docker. Docker can be installed on Windows, macOS, Linux, and Cloud platforms. Please check the requirements and download based on environment. The above command displays system wide information regarding the Docker installation like number of containers and images etc. Docker has many built in ways to quickly create a grid, scale nodes up or down when ever required with a single command. Selenium has also made a set of Docker images which are available on Docker Hub. We have Selenium Grid, and the browser images - Chrome and Firefox (for now), also with the debug versions which will allow us to access and view test execution using VNC. A Docker image is a read-only template with instructions for creating a Docker container. Once the pull is complete, it will show you status as 'Downloaded' at the end. We can explicitly specify the name for container, else Docker will automatically generate a unique name for each container. In the above command, we have given a name for selenium hub using --name. We can use this name to link node containers to the hub container. To check if the container has started, run docker ps command and see the status of it. If you see the status as 'Selenium Grid hub is up and running' then its time to start registering the nodes to hub. Now again type docker ps -a command in your terminal, to see a list of containers that are currently active. This will bring up total three containers Selenium Hub, Firefox node, and Chrome node. We can also see the nodes registered in Grid Console. Enter Grid IP and observe that Chrome and Firefox nodes are connected to Hub. Done !!! Now your grid configuration is ready. You can execute your selenium automation scripts as you do. If you want view test execution, we need to pull 'debug' images, which allow us to see the browser executing tests. By using docker ps –a command, you can see all the Docker containers and their running ports. Now link these nodes to container hub. Now we can view browsers by using VNC viewer. Enter your hub URL and port number of each browser (debug browser chrome/firefox) and Click connect button. VNC viewer will ask you for a password to show you the browser. Type the defauolt password as 'secret' and then click 'Ok' button. How to increase nodes ? Now check the Grid console, it will have total 3 chrome and 3 Firefox instances running. We have executed multiple commands to get Selenium Grid Hub and nodes up and running. Now Let us have all together and start Selenium Grid By running a single docker-compose command. What is Docker Compose ? We will create a docker-compose.yml file and see how the images interact with each other. Docker compose uses ".yml" file to create and start all the services defined. To install Docker Compose, you’ll need to install Docker first. We assume that you have already installed docker, now please install docker compose and proceed. Below is the command to install docker-compose, check for the latest release and replace version in the command below if necessary. sudo curl -o /usr/local/bin/docker-compose -L "https://github.com/docker/compose/releases/download/1.11.2/docker-compose-$(uname -s)-$(uname -m)"
That's all. We are all set to go, to pull and run Selenium Grid Hub and Nodes with a Single command. Docker Compose will download the images, configure, and start them running. Before running Docker Compose, we will stop running containers (if there are any) and remove by running below commands. We will create a simple Docker-compose file like below and add this to the repository. Below is the simple Docker-compose.yml file to pull, link and run Selenium Grid Hub and nodes. In the above docker compose file, we have defined selenium hub entity, pointed image name and assigned the port. We have defined and linked two nodes firefox-node and chrome-node. Just navigate to the location where docker-compose.yml file is located and run the below command. After running above command, check 'docker ps' or open Grid console to see grid Hub and nodes running. When there are huge tests that need to run parallel, two nodes may be not enough. Docker-compose has a great feature which allows us to scale number of similar containers with single command. This will show you all the containers that are registered to the Hub. It just took few minutes/commands to have Selenium Grid up and Running successfully. Hope this helps you to setup Grid on your containers and run selenium tests with simple command.